This was not how Livingston’s campaign was supposed to begin. They lost their promotion-winning manager David Hopkin, then saw Kenny Miller depart in acrimonious circumstances. Talk of a club in crisis abounded. Evidently no-one bothered to inform Gary Holt, who maintained his 100 per cent record since taking the helm at the Tony Macaroni Arena at the expense of an utterly impotent Hamilton outfit. Livi’s admirable group of players, given no hope of reaching the Premiership in the first-place, are once again upsetting the odds and look increasingly at home in the top-flight. This was ultimately a routine win and should have heralded a more handsome margin of victory. 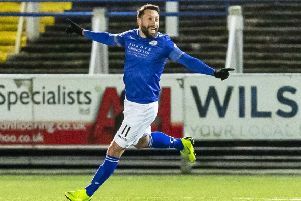 Steven Lawless netted what proved to be the decisive goal in spectacular fashion after just three minutes, dispatching a marvellous dipping, swerving drive beyond Gary Woods. Craig Halkett would go on to hit the post, while Scott Pittman and Dolly Menga came close. The Lions - tipped to endure a relegation battle in so many quarters - are now in the rarified air of third place in the Premiership, level on points with Celtic. “It’s been five games,” smiled Holt, tempering some of the fervour. “It’s good while it lasts and we’ll take it. “I certainly know we’ll lose games as well as win them. Yes, it’s great to have three wins in a row and is testament to the lads and the staff that were here before me, to keep things seamless. I’ve just fine-tuned and tweaked. Foremost among those attacking talents is Steven Lawless who, mercifully for Holt, does not always follow his boss’ instructions. “I was actually telling him ‘go beyond, go beyond’ as the ball came out to him,” smiled Holt as he reflected on Lawless’ first goal for the club. “Then he decided to hit it. I guess he shouldn’t listen to me! Livingston’s triumph should have been far more handsome, particularly in light of an completely dominant first-period. Following Lawless’ goal, Dolly Menga, an unpredictable firecracker of a forward, unleashed two speculative drives off target in the space of five minutes. One suspects the Angola internationalist will drive Holt to distraction on occasion, but will also torment SPFL defenders with his explosive, direct style. Halkett struck the post after meeting an excellent Keaghan Jacobs set-piece, while Menga passed up a golden opportunity to double Livi’s advantage by shooting wide from point-blank range after meeting a Gallagher knock-down. However, Livingston’s profligacy did not prove costly, with Hamilton unable to rouse themselves to a response.